Eleven Members of Parliament have died in office since the inauguration of the Fourth Republican Parliament in 1993. Six of the deceased were from the National Democratic Congress (NDC) and five from the New Patriotic Party (NPP). 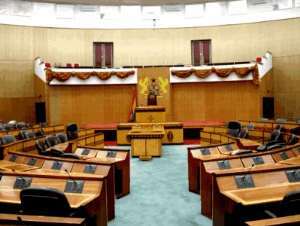 Statistics made available to the Ghana News Agency by the Electoral Commission (EC) indicated that five members died during the First Parliament between 1993 and 1996, two in the second between 1997 and 2000 and five between 2001 and 2004. Regional figures indicate that Ashanti, Brong Ahafo, Upper East and Central Regions lost two MPs each over the past 12 years. Volta, Greater Accra and Upper West Region have each lost a member. The deceased were: Mary Eugenia Ghann, (NDC New Edubiase); Emmanuel Obeng-Mensah, (NDC Wenchi East); Samuel Amonoo Koto, (NDC Tano South); Godfred Abulu, (NDC Navrongo Central); Wisdom Isidore Seyena-Susu, (NDC Ketu South) and Clement Samuel Crabbe, (NPP Ablekuma Central). The rest were Luke Koo, (NDC Lambussie), Reo Addai Basoah, (NPP Kumawu), John S. Achuliwor, (NPP Navrongo Central), Emmanuel Acheampong, (NPP Gomoa East), and Charles Omar Nyanor, (NPP Upper Denkyira). As it is often said "the king is dead; long live the king, so must it be as parliamentarians die new ones pop-up". The EC has organised by-elections in 10 out of the 11 affected constituencies. There was no by-election in Ketu South in 1996, in fulfilment of the Article 112 (6) of the Constitution, which states: "Notwithstanding clause (5) of this article, a by-election shall not be held within three months before the holding of a general election." Members, who entered Parliament after the death of the incumbent were: Mrs Theresa Joyce Baffoe (NDC New Edubiase); Mr Hayford Osei Kwadwo (NDC Wenchi East), Nana Kodua Kwarteng (NDC Tano South), the late Mr John S. Achuliwor (NPP Navrongo Central), Mr Victor Okuley Nortey (NPP Ablekuma Central), Mrs Alice Teni Boon (NDC Lambussies), Mr Yaw Baah (NPP Kumawu), Mr Joseph Kofi Adda (NPP Navrongo Central and Mr Richmond Sam Quarm (NPP Gomoa East). Meanwhile three candidates are contesting the by-election in the Upper Denkyira: They are Madam Elizabeth Debrah, 40-year-old Teacher, on the ticket of the Democratic People's Party (DPP); Mr Benjamin Kofi Ayeh 42-year-old Accountant, for New Patriotic Party (NPP) and Mr Abdulai Issaku 34-year-old Businessman, an Independent Candidate.